The Western Great Schism began on September 20, 1378 with the election of Clement VII in Avignon, France. He was the second pope elected by the same college of cardinals in six months, and for the first time in history there were two "legitimate" claimants to be head of the church in Rome. Before the Western Great Schism came a time sometimes called the Babylonian Captivity of the Church; a time when the pope, the bishop of Rome, ruled not from Rome but from Avignon. In A.D. 1294 Benedetto Gaetani was elected and took the name of Pope Boniface VIII. Europe was in great conflict at the time. In Germany, Albrecht I, son of former German king Rudolph I, was trying to regain the throne from Adolf of Nassau. England and France were threatening each other in what would eventually become the Hundred Years War. There was also conflict over the papal throne, which the powerful Colonna family of Italy had hoped to obtain. Boniface VIII was a skilled and experienced player of power politics, however, and he went rapidly to work. He was able to overthrow the Colonna family and seize their lands by calling a crusade. He also obtained a favorable peace with Albrecht of Hapsburg, but he was not so fortunate in France. Long, intense political battles that don't belong on this web site raged for almost a decade with Philip IV of France, and Philip proved to be the better politician. In the midst of a losing battle, Boniface resorted to his strongest weapon, excommunication. Their intention was to force the pope to resign. He refused, even at threat of death. So his captors sat him backwards on a horse and paraded him through his home town. Boniface's political failures meant he had few defenders, even in his native Italy. The battle with Philip was over. Boniface died not long after, and Philip, not wishing to continue fighting a pope, gathered French cardinals and elected Pope Clement V in Avignon in 1305. Clement, a political puppet, never set foot in Rome during his entire papacy. The comedy of all of this is that the pope is not simply the pope. The pope is first the bishop of Rome. He is only the pope because the office of bishop of Rome carries such authority in Roman Catholic theology. There's a decent explanation of this on my "Bishops" page. The bishop of Rome was absent from his office for 72 years! His successors continued to reside in Avignon until Pope Gregory XI returned amidst great rejoicing in 1377, some 72 years later. If you read the dates above, you realize that the return of the pope to Rome was not terribly successful. Gregory XI died within a year of returning to Rome, and a religious, austere man, Pope Urban VI, was chosen in his place. He seemed so holy that there was hope for reformation in the clergy, especially with the pope having returned to Rome. The problem was that Urban VI was … well, let's just say he was something less than shrewd. He alienated his own court—consisting mostly of bishops of other cities— by calling them traitors to Christ for abandoning their bishopric (area of authority). He followed that with similar indiscretions until no one liked him at all. Then, he committed a fatal political blunder. He decided to take on the French by appointing a vast number of Italian cardinals so the French cardinals would be outnumbered. And he announced it before he did it. Reports circulated that he had gone mad, and even the Italian bishops forsook him. 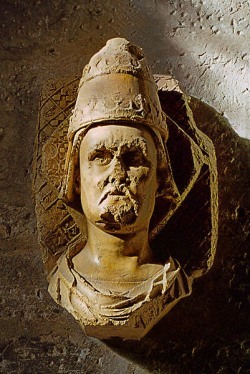 The entire college of cardinals gathered in Avignon, declared that they'd been forced to elect Urban, and—only six months into Urban's reign—they elected Clement VII in his place. The Italian cardinals chose not to take part in the election, but they were there and did not complain. Suddenly, there were two popes; both duly elected, and both legitimate successors to the throne of Peter by ecclesiastical rules. The Western Great Schism had begun. When the general council deposed the two concurrent popes, they declared the popes in France to be illegitimate. Thus our Clement VII, from the 14th century in France, is now an "antipope," and a later pope in the 16th century has gone down in history as Pope Clement VII. There have been other antipopes, including Hippolytus, who declared himself bishop of Rome in A.D. 225 because of his dissatisfaction with the current bishop. Of course, there was no pope in A.D. 225. Clement chose to make peace using a method commonly employed by popes in medievel times. He gathered an army to kill or unseat his rival. Europe was divided over which pope to back. Their decisions were almost purely partisan political ones. If you were for France, you supported Clement VII. If you were against France, you supported Urban VI. No solution would be coming through politics or war. Charles VI of France decided he liked option 1. Confident for some reason that he could get the pope in Rome to resign, he tried to persuade Pope Benedict XIII to resign as well. Benedict wasn't interested, so Charles sent an army to lay seige to Avignon. Benedict, however, was able to hold out, and Charles never accomplished his goal. The Western Great Schism went on 31 years—through four Roman popes and two in Avignon—before a general council was finally called in 1409. The council chose to depose both popes and elect another, Pope Alexander V.
Both of the popes in 1409, Benedict XIII of Avignon and Gregory XII of Rome, refused to accept the council's decision. Now there were three popes!!! Worse, the situation did not end quickly. Alexander V died within a year, and the council elected Pope John XXIII in his place. Both Alexander and John had attempted to reign in Pisa, Rome being occupied by Gregory, but John was unable to remain there. He was forced to flee to Germany. Thank God for Emperor Sigismund of Germany. He agreed to protect John XXIII only on condition that he agree to another general council. Sigismund managed to assemble that council in 1414. They, like the previous council, rejected all the current popes, and they elected Pope Martin V.
Here's what happened to the other claimants. John XXIII went into hiding when he realized that he would not be allowed to keep his title. For several months he was able to claim to be pope before he was found, forced to resign, and imprisoned for the rest of his life. Like the Avignon popes, he and Alexander V are considered "antipopes" by the Roman Catholic Church. Benedict XIII holed up in a fortress and lived until 1423 claiming to be pope. Fortunately, everyone ignored him, and he had no successor. Gregory XII … actually resigned like he said he would. Wow.